The White House had no comment Monday on a Trump tweet from the weekend that raised even more questions than usual. Mark your calendars, President Donald Trump announced on Twitter Sunday. He said a new Fourth of July celebration at the Lincoln Memorial was coming this summer, apparently adding to an already crowded day of festivities in the nation's capital, and featuring, as he put it, "your favorite President, me!" "HOLD THE DATE! We will be having one of the biggest gatherings in the history of Washington, D.C., on July 4th," Trump tweeted. "It will be called 'A Salute To America' and will be held at the Lincoln Memorial. Major fireworks display, entertainment and an address by your favorite President, me!" Although Trump indicated it's all a done deal, details were scarce on Monday. Would the military be involved? "We have nothing to offer you at this time," said a Pentagon spokesman who referred questions to the White House. A spokesman for the National Park Service said a program for Trump's event is being developed, and directed questions about the content of Trump's tweets -- to the White House. "While no final decisions have been made, we continue to work on creating a "Salute to America" program that will bring Americans from all over the country together in celebration of our great nation," said Mike Litterst, a spokesman for the National Park Service. It's also unclear how Trump's announcement of a new Fourth of July celebration will fit in with the numerous events that for decades have taken place on the National Mall, including a nationally-televised concert that takes place just before one of the country's best-known fireworks displays. Now in its 39th year, "A Capitol Fourth" features a slew of performers backed by the National Symphony Orchestra on the U.S. Capitol West Lawn followed by fireworks exploding behind the tip of the Washington Monument -- creating memorable images seen on screens and newspapers nationwide. PBS broadcasts the celebration live with more than 20 cameras stationed around the Mall, according to the event's website. When asked how Trump's announcement may affect "A Capitol Fourth's" celebration, Jennifer Rankin Byrne, PBS's vice president for corporate communications, said PBS is currently not commenting on the matter. People watch fireworks as they celebrate US independence day on July 4, 2017, in Washington, DC. D.C. Mayor Muriel E. Bowser's spokeswoman said in a statement Monday that their office is still determining how the president's announcement may affect current events already planned. "Every year, Washington, D.C., celebrates the 4th of July with a handful of parades, a matinee baseball game at Nationals Park, a Folklife Festival on the Mall and neighborhood cookouts in all 8 wards," said LaToya Foster, Muriel’s spokeswoman. 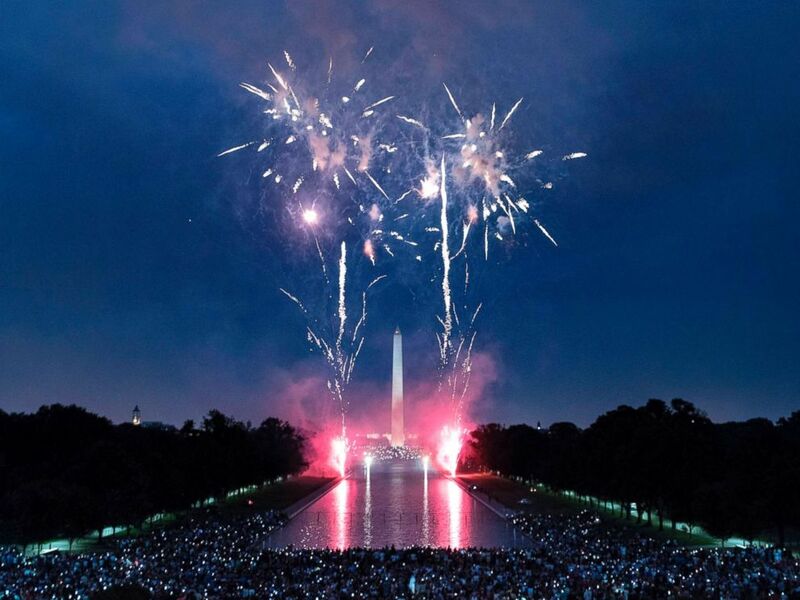 "The day culminates with music and fireworks stretching from the Capitol to the Lincoln Memorial on the National Mall. Like you, we are still assessing what will be different this year but we know these celebrations only truly salute America when they are inclusive, diverse and welcome all." The National Park Service is also listed on "A Capitol Fourth's" website as a co-sponsor of the event. It's unclear if the agency is still involved while it works on Trump's July Fourth celebration, as a spokesman did not respond to follow-up questions. According to the Associated Press, the White House has not provided a cost estimate for the event. "We get free fireworks because it's already being done," Trump said in a Cabinet meeting earlier this month in reference to annual fireworks over the National Mall. "So that's very good." 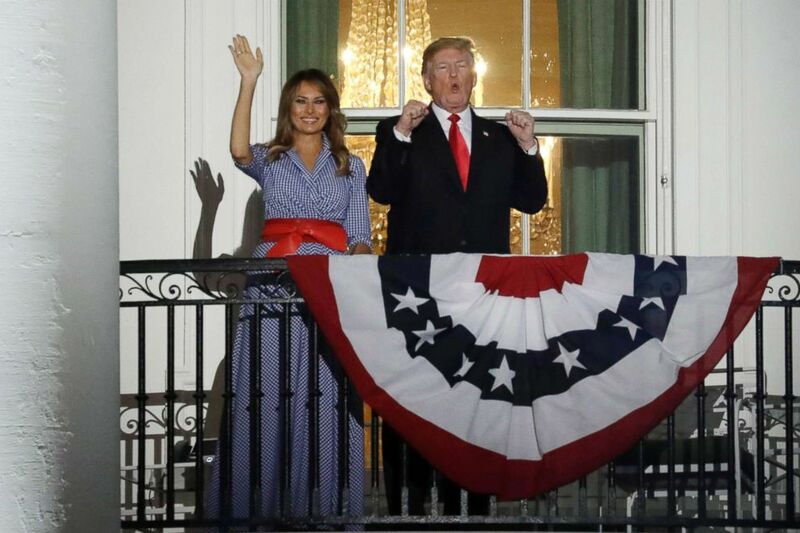 President Donald Trump, right, gestures as First Lady Melania Trump waves from a balcony of the White House during a fireworks display in Washington, D.C., July 4, 2018. People were quick to criticize Trump's announcement on Twitter. Rep. Eric Swalwell, a Democrat from California, joked about how Trump's announcement duplicates similar Fourth of July celebrations that already take place. "If this goes well, I think we should follow it with a big party in Times Square the night before New Year's Day," Swalwell tweeted Sunday. Richard Painter, an Independent, former chief White House ethics lawyer under George W. Bush and vocal Trump critic, sarcastically said, "This is a brilliant idea!" "Fireworks on the 4th of July! We never would have thought of it without @realDonaldTrump. What an amazing president!" Painter tweeted Sunday. We never would have thought of it without @realDonaldTrump. Bill Kristol, a Republican who served as Vice President Dan Quayle's chief of staff in the George H. W. Bush administration, accused Trump of making himself the focus of the holiday commemorating the United States gaining independence. "His vulgarity knows no bounds, his narcissism no limits," Kristol tweeted of Trump. Trump's fascination with parades isn't new. Last year, following his July visit to Paris, Trump requested that the Pentagon plan a military parade in Washington similar to the Bastille Day parade he had witnessed. "It was one of the greatest parades I've ever seen," Trump said of France's Bastille Day parade during a meeting in New York with French President Emmanuel Macron at the time. "So, we're actually thinking about Fourth of July, Pennsylvania Avenue, having a really great parade to show our military strength." But seven months later Trump canceled the celebration, blaming local politicians for the rise in costs. At the time, a U.S. official told ABC News that the estimated cost of the parade rose from the original price tag of about $12 million to $92 million. Trump isn't the only president to organize a Fourth of July celebration of his own. In 1970, supporters of then-President Richard Nixon organized an "Honor America Day" for July Fourth, featuring entertainers and fireworks, according to the New York Times. In a column the day after the event, New York Times reporter Tom Wicker said the celebration was overshadowed by the Vietnam War, which he called for an end to. "...America is not in the flag, and not in the Washington Monument or the White House, and not in anybody's oratory, and not even in prayer. America is in the hearts of Americans, and if it is torn and angry today, it is aroused, too, and groping for its heritage, and not so complacent as to believe that fireworks and brass bands can help redeem it," Wicker wrote at the time. ABC News' Luis Martinez and Avery Miller contributed to this report.